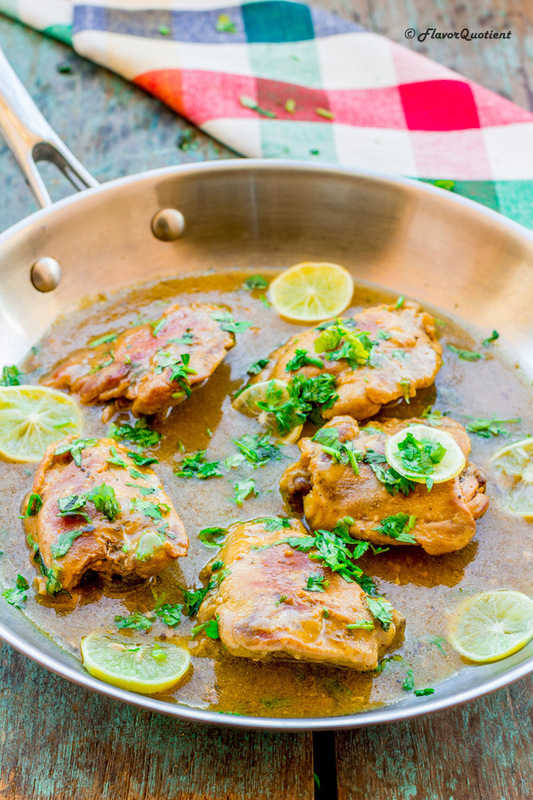 This tantalizing lemon chicken turned out to be super delish with minimal effort making it a great option for weeknight meal! 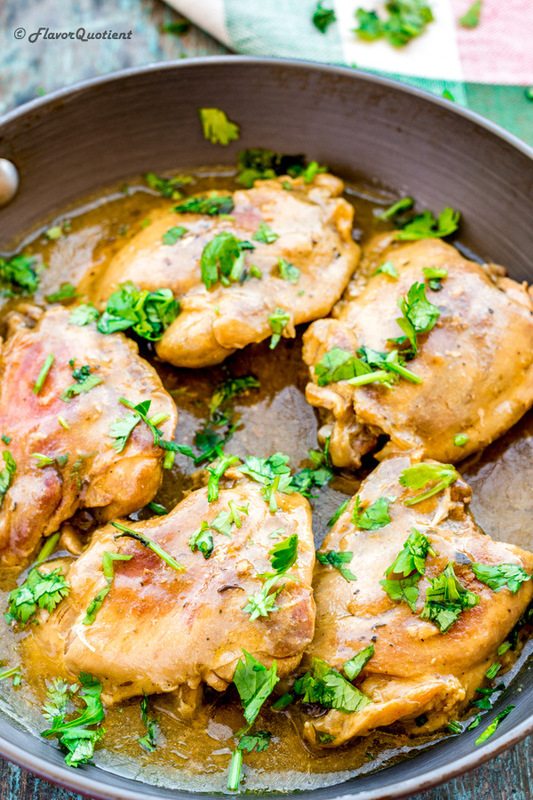 Serve this lemon chicken with rice or mashed potatoes for a wholesome dinner! I am sure you are already fond of lemon chicken and have your own secret recipe which you adore too much to share! Tell me, am I not right? 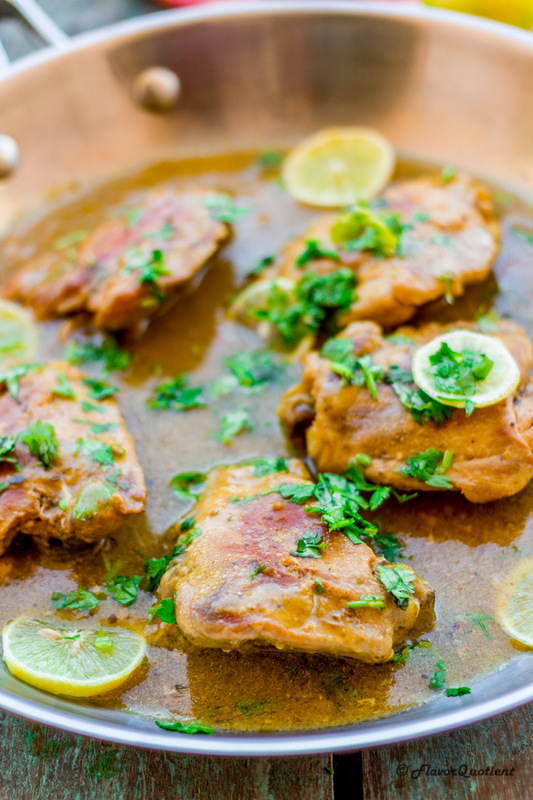 Lemon chicken is a genre of recipe on its own and I am sure every part of the world has its own version. Asian stir fried lemon chicken is something very different from what I am sharing here today. 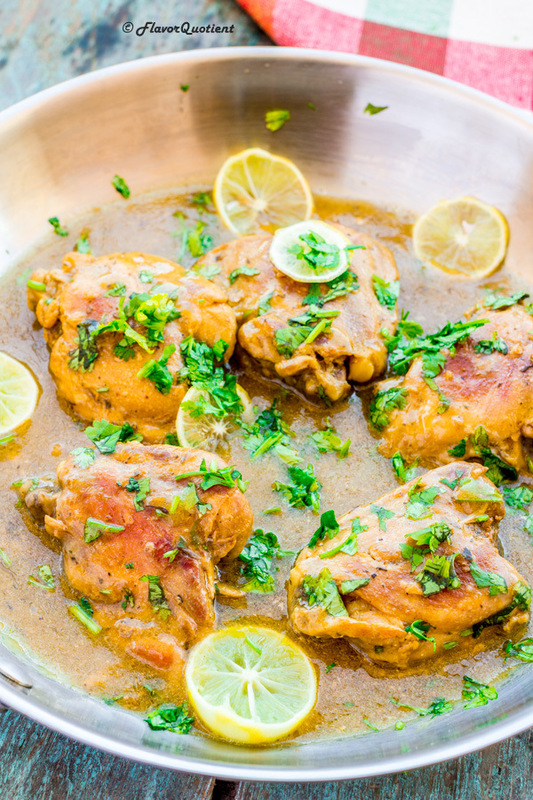 My today’s lemon chicken recipe is an easy baked version infused with herbs and a buttery sauce clinging to the chicken making it more delicious. Lemon and chicken are real best friends when it comes to pairing the flavors with chicken. Even though my favorite aromatic is garlic which, I feel, enhances the taste of chicken a zillion times; but this tartly and herby lemon chicken blew my mind too with its lusciousness! Chicken is undisputedly my favorite choice when it comes to making quick and filling meaty meals especially on weeknights. Chicken cooks really fast and you don’t need to invest long hours to marinade them in aromatics for each and every recipe. Same goes with my lemon chicken thighs which are first lightly browned in a pan in garlic infused oil and then baked in the oven until completely cooked. But the delightful flavors which make this lemon chicken worth the effort, even though minimal, come from the herby rub made of lemon zest, oregano, thyme and mustard powder mixed in extra virgin olive oil. This combination of aromatics and herbs is a total winner and can be used on anything besides chicken e.g. shrimps or salmon or any other fish fillet. You can play around with your favorite herb combos but this worked for our lemon chicken really well. This one pot baked lemon chicken recipe not only contains tasty chicken but a very luscious lemony sauce which is just too good to describe. This lemony sauce is made with roux which is a mixture of butter and flour. Roux is a fantastic thing to make the sauce glossy and tasty taking it to another level altogether. You also need to have a good quality chicken stock to ensure your lemony sauce is as flavorful as it can possibly be. I recommend to make your own chicken stock as shown here as it’s a super easy task but guarantees maximum flavors as possible without any preservative and taste enhancer. Once you start making your own chicken stock, I am sure you would stop buying the readymade stuff or at least minimize it as much as possible which is exactly what I did. You may already have started wondering where is the lemon part in this lemon chicken! Yes yes, I agree you have reached here while searching for lemon chicken recipe and I promise I am sharing exactly the same. 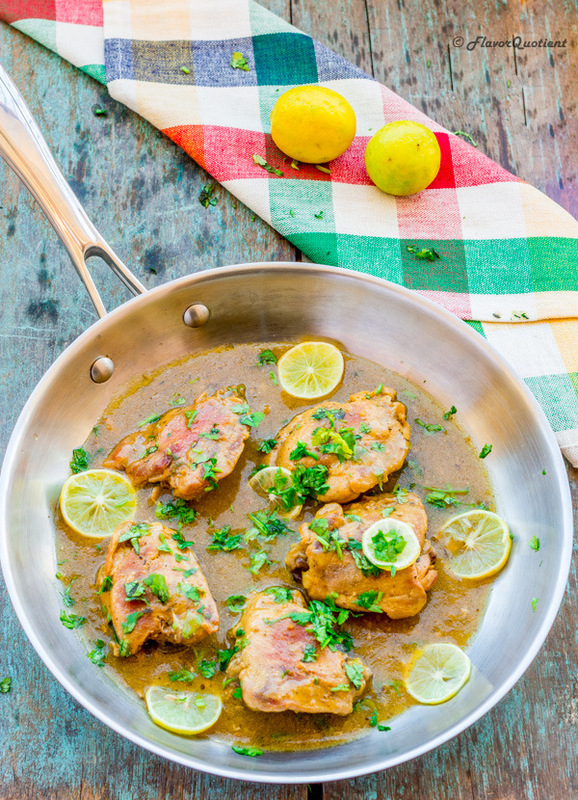 The refreshing lemony aroma is infused into this one pan lemon chicken through two channels – lemon zest and lemon juice. I am sure you had already guessed that as it wasn’t a rocket science at all. Don’t omit lemon zest from this lemon chicken recipe as they add a very rejuvenating touch to the dish; you may optimize the amount of lemon juice depending on how much tartness you prefer. Serve some lemon wedges on the side with lemon chicken for everyone to adjust their palate according to their personal liking. Enjoy your lemon chicken with some creamy mashed potatoes on the side and you have a fine dining experience right inside your home! Enjoy! Pre-heat the oven to 200 degrees C (400 F). Make rub for the chicken by combining mustard powder, 1 teaspoon of the lemon zest, oregano, thyme, salt and 1 tablespoon of the olive oil in a small bowl. Coat the chicken pieces on both sides with the mustard rub. In another small bowl, combine remaining lemon zest, lemon juice and the chicken stock. Set aside. Heat remaining oil in a large oven-safe skillet or frying pan over medium heat. Add the minced garlic and cook about 1 minute until fragrant. Add chicken to the hot garlic-infused oil and cook for couple of minutes until the chicken has turned golden brown. Flip the chicken and then add the lemon juice mixture which you had prepared earlier. Stir and slide the pan into the oven and bake for 25 to 35 minutes or until a thermometer inserted into the thickest part of the chicken reads 79 degrees C (175 degrees F). Take out the pan from oven, transfer the chicken to a plate and cover with aluminum foil. There should still be liquid in the pan. Place the pan over medium heat and bring the liquid to a gentle simmer. In a small bowl, mix butter and flour together using your fingers and make a dry, crumbly paste. This is called ‘Roux’ (pronounced as ‘RUE’) which basically acts as a thickening agent. Whisk this flour and butter mixture into the sauce. The sauce will thicken and look glossy. Nestle the chicken thighs back into the pan, give a final boil and serve your lemon chicken on a bed of creamy mashed potatoes. This looks delicious. I love lemon chicken. Thanks! Even we are also addicted to it since the time we have tried it first!